How are social impact bonds created and implemented? This blog post was originally published on the Discover Society – Policy and Politics blog on 4 December 2018. In 2010, the UK’s Ministry of Justice established the first Social Impact Bond (SIB) – a new policy tool, designed to link the outcomes of social interventions to payments. The idea was that the financial risk of these interventions would be borne by a private investor rather than public funds. 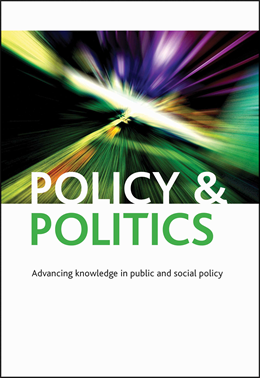 In our recent research article published in Policy & Politics, we set out to offer one of the first detailed accounts of how these mechanisms are created and implemented. Our results highlight three levels of analysis (macro, intermediate and micro) where tensions and congruencies can be found. Our analysis of key stakeholders within an emerging SIB based in a northern city in England demonstrated two underpinning ‘discourses’ and ‘institutional work’ associated with their creation and implementation. (1) a discourse associated with delivering a social intervention (2) a discourse associated with the SIB mechanism. Across the two year period of study, our findings show that these discourses can be closely aligned or at odds with one another depending on the level of analysis. When analysed at a macro policy-making level, our findings show congruence between stakeholders as they plan to develop new mechanisms for funding and developing capacity of the voluntary sector. Operationally, we further identify significant tensions and conflicts at an intermediate and micro level. At an intermediate level, managing the complexity of the SIB contract and the performance of those delivering social interventions creates tensions as a consequence of the contract’s outcome-oriented targets. At a micro-level, where the care work of the social intervention takes place, the SIB mechanism appears to elicit a set of conversations around producing the right data for the contract rather than care for the beneficiary. Therefore, whilst the discourse of change may be closely aligned at a policy level, it appears at odds at the intermediate and micro delivery levels. Our study contributes to research in this area in two important ways. Firstly, it provides one of the first detailed accounts of SIB formation and implementation. This required developing a micro-level understanding of decision-making among the main actors involved. Secondly, it shows that the discourses associated with the “work” of setting up a SIB can be conflictual. If such tensions and conflicts are apparent in other SIB programmes then this has serious implications for how those contracts work and potentially the type of care received by beneficiaries. * Mike Martin not pictured.